I'm trying to get a bit more accuracy into the anatomy of our protagonists... practicing in public used to make me a little timid, but these days I'm less bothered. I bought an app from the iTunes store that allows a mannequin to be moved to any position you fancy, so I can see what sort of shapes I should be drawing, but it's proved a bit of a pain to get the model in the right place. no time to write today, have to catch a train to Bolton for a meeting tomorrow, so rushing this in before I think about leaving the house. 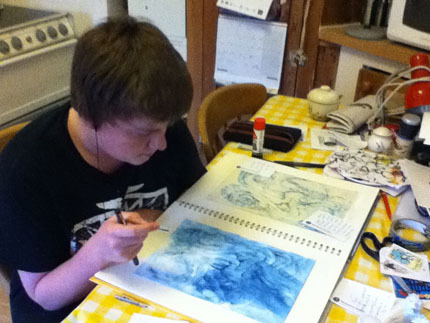 A long weekend spent teaching Dom a range of different painting techniques so he can experiment for his GCSE. Anyway, the it means I ran out of time for doing the strip, so I cheated and did just one page. I wanted to have something more like the power-up screen in "Rainslick precipice .."
Just realised I've already drawn this pic somewhere before.. not sure if I posted it here. Will dig it out and stuff it up as a blog pic. It's been another busy week, lots of trips out and about, combined with a dog that seems to live for going on walks and doing enormous poos. Had another test for my CS degree this week too. Anyroadup, longing for a bit of a break around the beginning of April. Can't remember when I drew this, or for why? But it comes back to the current story quite nicely. Hope I'll be a little more relaxed this week. My body is adjusting to taking the dog for a walk at 6.30 every morning... Study continues to fill my other waking moments. I wait longingly for the end of the month and a bit of a break. 24 HCD is set for October 20th. This year I aim to use this as an opportunity to work up a little side project based on the BrightAngel team. Adam has been collecting ideas, but obviously the whole point is to work out the whole thing in just 24 hrs, so I'm not going to think about it too hard. You wouldn't believe how busy I've been. Seriously didn't expect to get anything done today, but just about managed to squeak in an hour. The monster that first appeared at the beginning of Wychwolf part 1 (http://www.wychwolf.com/?p=25) finally makes a bit of a come back, or his cousin does at . I'm quite tired this week. We have have a rescue dog, filling up the house, and reminding me of my life when the children were small. Anyway, I managed to sketch out Today's page using pen and paper with a dog occasionally poking it's nose into things... which made me speed up a little. The built in scanning support in lion seems to still be a bit poor, even though there was a recent system update which included canon scanner drivers. 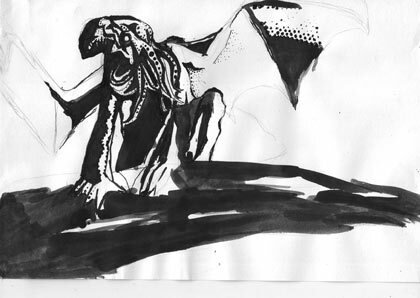 Anyway, ink was a .1mm Staedtler pigment liner, too fine to get picked up properly by the scanner.